Located in White Rock at the corner of North Bluff Road and Maple Street, the project vision is to create an affordable community within a 10 minute walk to the Semiahmoo Town Centre. The project will create a vibrant new community with a variety of housing types for “growing up and growing old” in the same neighbourhood, to support the diverse needs of White Rock residents. Buildings will be constructed from mass timber construction, implementing a pre-fabricated sustainable construction system that reduces construction time, enhances affordability, and sequesters carbon. The project provides community connectivity with open and engaging public realm spaces, including “the Beachway” - a public mid-block promenade that increases porosity of the neighbourhood by breaking down the scale of the large city blocks, enhancing the character of the built environment, and supporting the City of White Rock’s socially-oriented urban design principles. We are excited to announce that the Radium Community Hall and Library has been featured in a news article for The Columbia Valley Pioneer! Click here to read all about it! 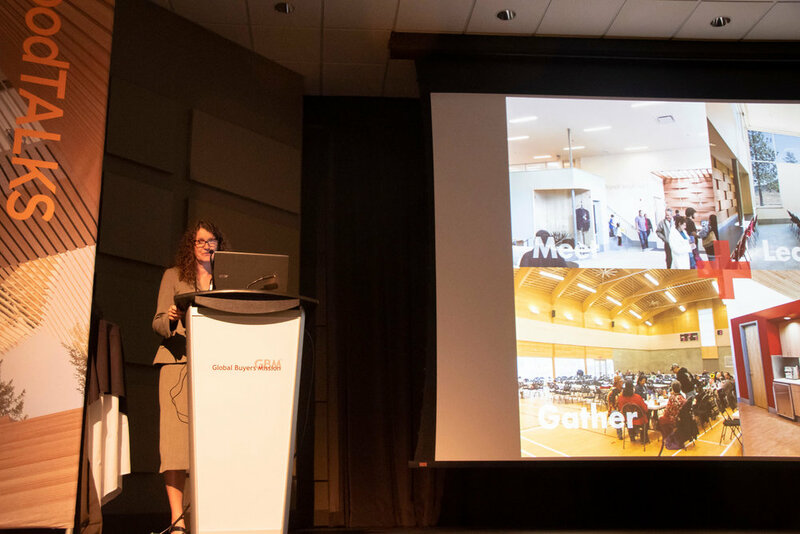 Shelley Craig presents our innovative mass timber buildings and consultation process at the Global Wood Buyers Mission in Whistler, Sept 6, 2018. See the link to her presentation “100 Mile Building” here. The 8,000 sq ft Hall and Library, opened on August 25 with a large celebration with over 200 people in attendance. The project was the result of a village wide stakeholder engagement process that commenced with a wood stakeholders meeting at the outset of the project to identify available trades in the valley. The result is a “100 mile building” with over 80% of the construction contracts awarded within valley. 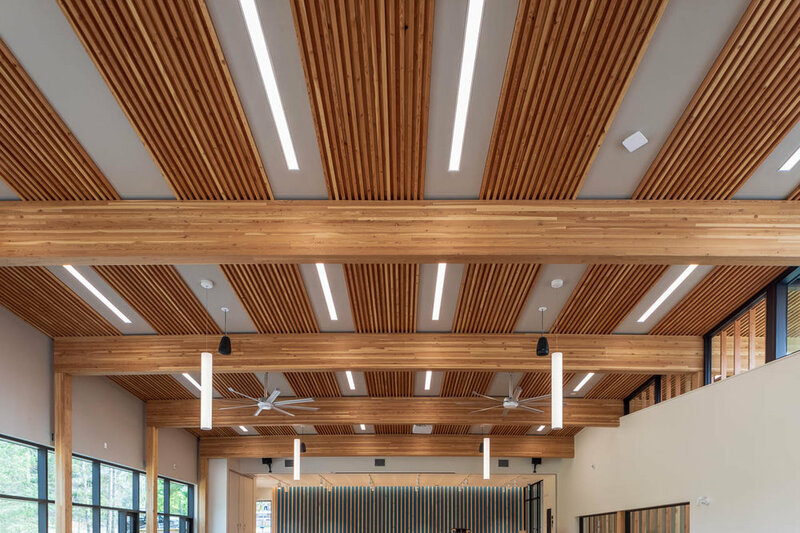 Wood innovation that resulted from the unique engagement process includes locally manufactured dowel laminated roof panels - a first for BC; and charred wood siding. Much of the wood in the project was supplied by Canfor from the Radium mill. The project was recently published on the Naturally Wood Website and has won the Woodworks! Community Recognition Award presented at UBCM (Union of British Columbia Municipalities) on September 12, 2018. Radium Hot Springs Community Hall and Library wins the WoodWorks! Community Recognition Award at the 2018 UBCM (Union of British Columbia Municipalities). Leadership in structural and architectural wood use by local governments was recognized yesterday at the Union of BC Municipalities (UBCM) Convention in Whistler. Five local governments were presented with 2018 Community Recognition Awards for use of wood in their community projects by Wood WORKS! BC. The province-wide awards are presented annually to communities that have been exemplary advocates for wood. This may be demonstrated through the specification of wood in a community project and/or through visionary initiatives that work toward building a community culture of wood. For more information, click here. "That message is that we come from the land, that we've been here since time immemorial and that the land and a relationship with the land is really important to us in the work that we do as architects, as designers." The work is on display in Venice until late November. Congratulations Ouri! The North Vancouver Museum is a vital addition in the larger redevelopment of the Lower Lonsdale Cultural District. It will be prominently located adjacent Carrie Cates Mews and Esplanade Ave, inviting the public in to discover the rich ecological and cultural heritage of North Vancouver. 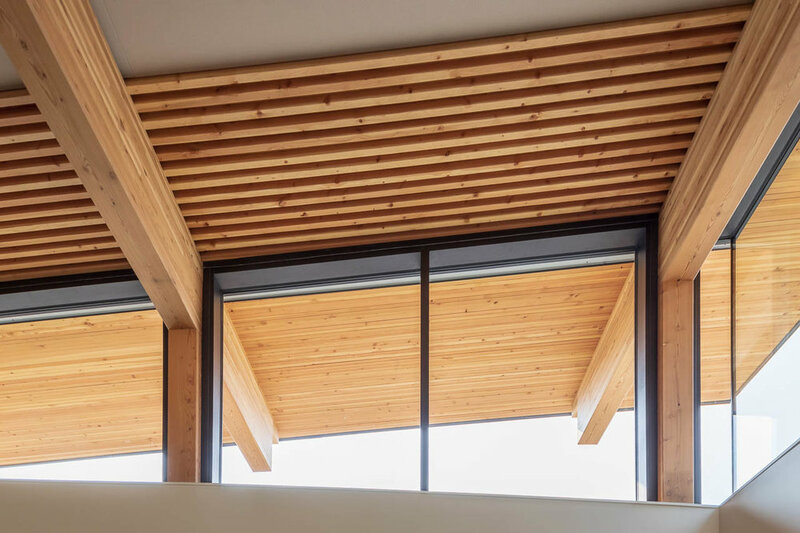 Urban Arts Architecture is completing a design that reflects the identity of North Vancouver through the use of natural materials and clean, modern detailing providing a fitting home for the important exhibits and artifact to be displayed therein. The museum features both Permanent and Temporary Galleries in addition to a Flex Space and Multi-Purpose Room that will provide public, bookable spaces for a broad range of events. The Lobby has been designed as a ‘public living room’ featuring an original commissioned cedar carving by local First Nations Artist, Wade Baker in addition to the refurbished electric street car that operated nearby in the early decades of the 1900s. The Project also includes the new Administrative Offices for the Museum and Archives. The Museum will be open to the public in 2019. 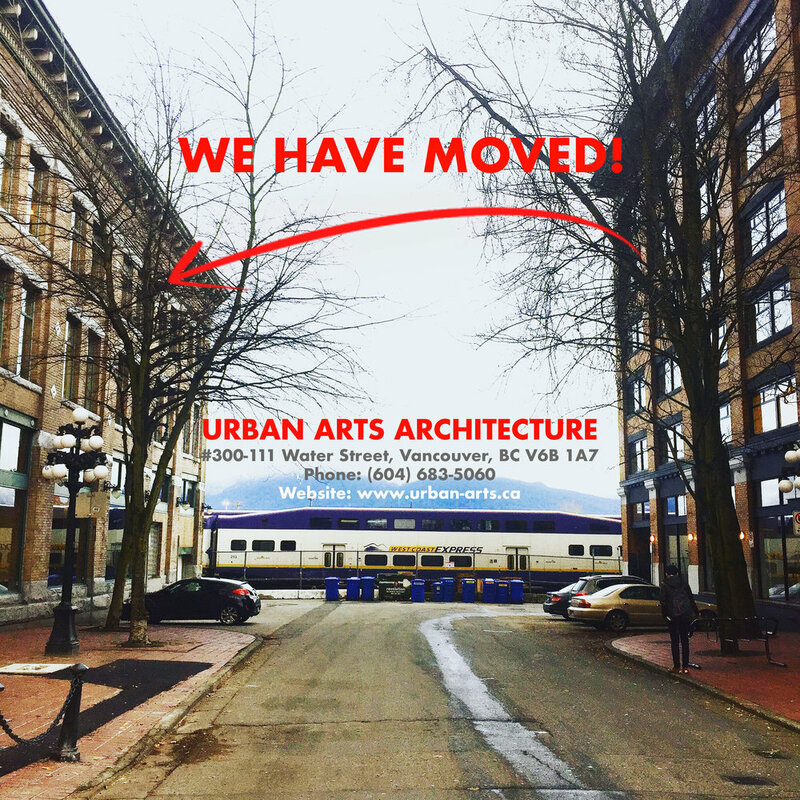 UAA is excited to announce that we have moved into our new office space! We have relocated our office across the street to #300 - 111 Water Street. We are loving the new space and look forward to sharing photos soon! 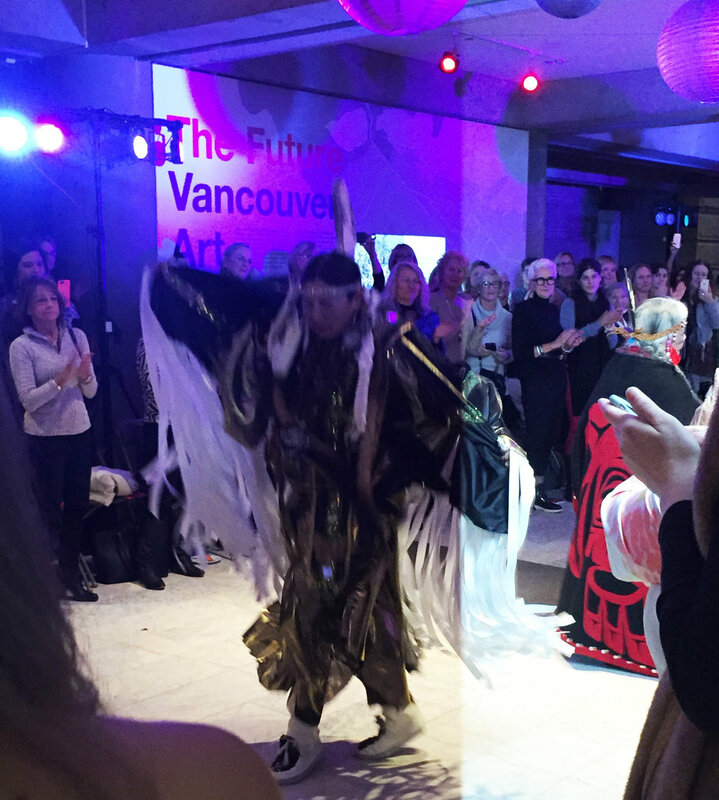 On November 3rd our team attended ‘Her Story in Focus’ at the Vancouver Art Gallery, in support of the Women’s Centre in the Downtown Eastside. There was a silent auction, a live auctioneer, and a fashion show, accompanied by canapés, wine and delicious desserts. 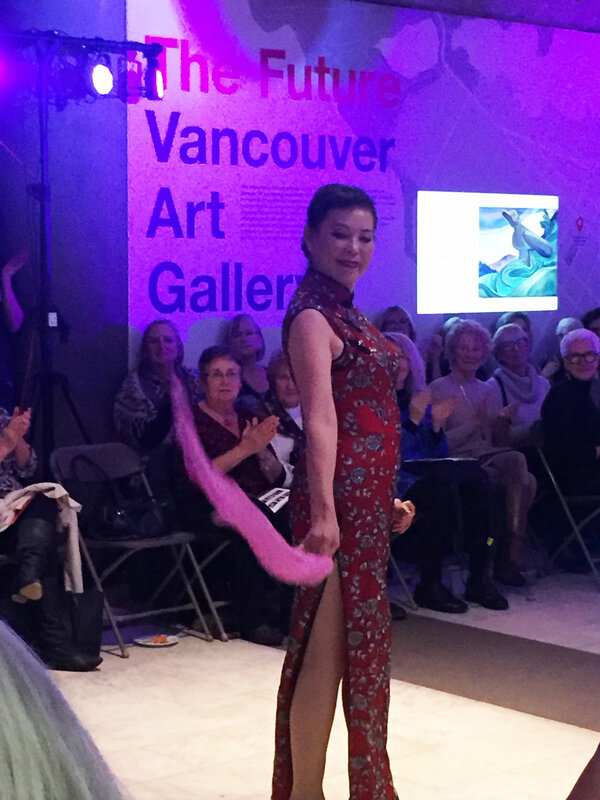 The fashion show featured women from the Women’s Centre walking in the fashion show, wearing a garment that they designed from resources that were donated to the centre. Some of our favorite looks were the hand-beaded traditional dress outfits, which showcased beautiful workmanship. 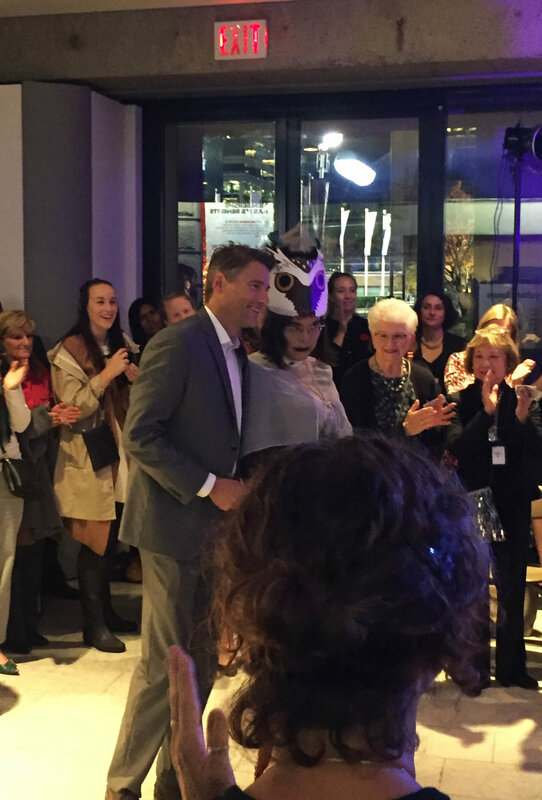 Mayor Gregor Robertson also attended the event, giving each woman who walked the runway a rose during the finale. 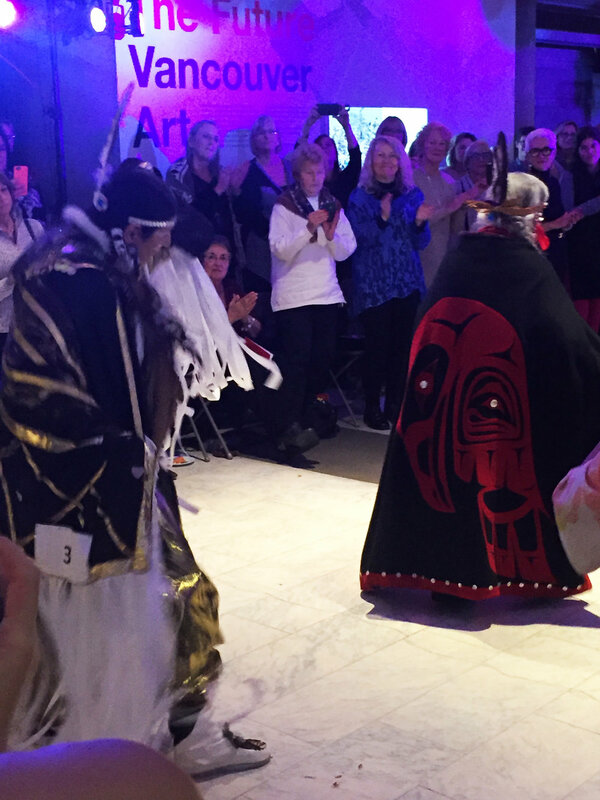 We are very excited to hear that they exceeded their goal of $35,000 and raised $50,000 going towards safe space, basic needs, and empowering support for women of the Downtown Eastside! ESC has been published in the 2017 fall edition of SAB magazine. Click here for a preview. The prefabricated Dowel-Laminated-Panels (DLT) are currently being installed on site. Manufactured locally by International Timberframes Inc., the framing will be completed in under two weeks. 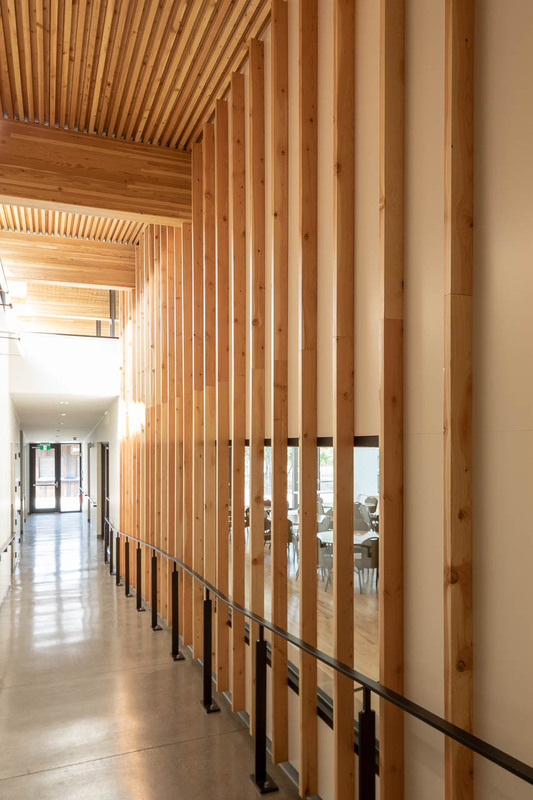 The DLT structure is comprised of a modular series of prefabricated panels of alternating 2x6 and 2x4 giving a variegated texture to the ceilings in the Library and the Community Hall. Click through the images below to see the emerging structure. Ouri Scott part of the UNCEDED team! Just announced, our own Ouri Scott is a part of the UNCEDED team selected to represent Canada at the 2018 Venice Biennale of Architecture. UNCEDED is an Indigenous design project led by Douglas Cardinal that includes indigenous architects from across Turtle Island, speaks to the unrelinquished traditional territories of Canada’s First Nations, Metis and Inuit people. In as much as this artistic contribution is about arriving from afar onto the shores of the Giardini-Arsenale — it is also about ceasing to go away. Learn more about UNCEDED at www.unceded.ca. Kelowna Main Branch Library renovation opened in March this year and has been widely embraced by the community. Read the description below of one days activities from Christine McPhee, Head Librarian! "Yesterday was a very exciting day at the Kelowna Library – and in the midst of all the hard work that everyone has and is continuing to put in to this branch, it’s worth taking a minute to reflect on the impact of all that work. I arrived at work yesterday afternoon to wander into the Pop-Up Makerspace to find Mark Reinelt, Amy Wright and Keenan Farquharson hosting the First Page Book Club (a reading club for adults with diversabilities that meets weekly at the branch) in the Makerspace – they all made laser etched and cut bookmarks out of wood on the laser cutter, and got their pictures taken in front of the green screen wearing a pirate hat so we could transport them to the deck of a pirate ship using the green screen app on our iPad! They loved it! It was the 8th day the Makerspace has been open this month and we again had over 50 people through – some return visitors who have become regulars – and most of whom stayed in the space for over an hour trying all the different stations. In the afternoon we started the second of a series of workshops we are doing with Work BC – Resume writing, cover letter writing, and interview skills. The first resume writing workshop had only one attendee – yesterday we had 6! Work BC is very pleased with the result and is excited to keep developing this series in partnership with us. We have identified that Work BC is only able to work with people who already have a base level of computer skill so there is an opportunity for us to deliver a “pre-requisite” basic computer course that they would refer people to – we are working on that now. In the evening, Jamie hosted our regular crowd of gamers – 28 people were there, including a few families who have become regulars – sharing their love of gaming in community. We also hosted a World Refugee Day event in partnership with KCR and Central Okanagan Local Immigrant Partnership – a screening of the film Taaloo Zorouna “A Visit with our Syrian Neighbours” made by a faculty member at UBCO in which she interviewed several families who recently settled in the Okanagan from Syria. Mayor Colin Basran attended to open the event, along with a couple of the families in the film and the film maker. There were 60 people in attendance to learn about and offer support to the new refugee families living among us, and the space and the projection were perfect – even on a bright sunny evening. The Spanish Language Intercambio group – who are already outgrowing our new meeting rooms – had a full house last night of 12 people. This group has grown from a few English speakers practicing Spanish to a nice mix of native English and native Spanish speakers learning both languages in cooperation. And finally, a Community Support Group was also meeting in the branch in one of our new meeting rooms. We had a total of about 185 people in programs / meetings yesterday (without any children’s programming running!) – but those numbers don’t tell the story of the diverse range of activities, and the diversity of communities we are supporting in Kelowna. And this was just one day. Kelowna Library is an amazing place to be most of the time – but it was extra specialyesterday so I thought I’d share. None of this would be happening without the support we’ve had to renovate this space to meet community needs, and without the amazing staff who build community and relationships one customer interaction at a time." Our second Collegium opened this spring, providing a home on campus for commuter students. UAA worked with UBC to develop the design guidelines for the Collegia and now has finished two on campus. Open to first year students, the Collegia provide a place for students to socialize, study,and make and meet friends, establishing a home and a circle of support. UAA recently finished a renovation in the University Services Building at UBC. We added a new mezzanine over the existing Pipe Fitting Workshop while maintaining access to the workshop during construction! Check out some more photos of the renovation here. The Cooks Ferry Duplexes are starting on site this month. Working closely with the Cooks Ferry Band, UAA has developed the first new housing in the community in 20 years. 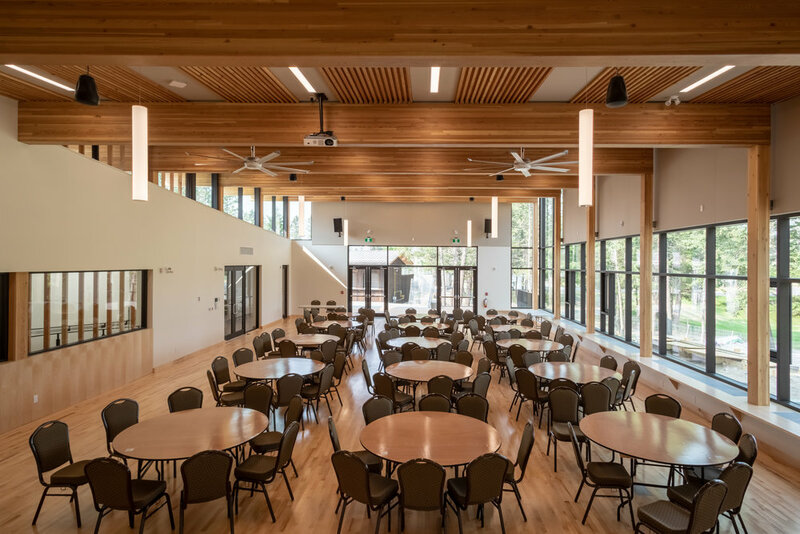 Featuring passive design strategies, the duplexes have been designed to allow elders to age within the community and to remain in close connection with their extended families. ESC will be featured in the SAB Fall issue! The UBC Engineering Student Centre will be featured in the SABMag Fall issue. The LEEDTM certified project “Living Lab” design showcases innovative engineering strategies. UAA is honoured to have been selected to work with UBC to develop the design guidelines for this significant new program on campus. This space will reflect the goals of UBC Policy 131 reinforcing UBC’s commitment to the safety and security of all its members and its responsibility to maintain a respectful environment where its members can study, work and live free from concerns of sexual assault. For more information on UBC Policy 131 visit the UBC website here.